The RV sewer hose goes by many names, the “Pooper Mover”, the “Stinky Slinky” and the “Sludge Snake”. What this essentially does is move human waste out of your RV’s waste tanks. You’ll never know what could go wrong, or what you would have to deal with if something does. Therefore, owning a quality RV sewer hose kit is very important, so that all your waste is removed successfully, and that the hose is never clogged. In this review, we will show you to five serviceable RV sewer hose kits from companies such as Camco, Thetford and Lippert. These kits each have some great features and characteristics, but of course, there are some things that you have to watch out for. We will then determine which is the best RV sewer hose kit for your investment. 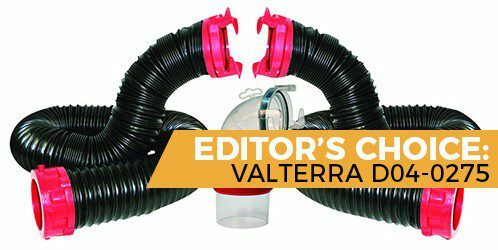 This is an interesting hose kit from Valterra, but does it get the job done? The main feature is a thick, 20-foot hose that you can take apart in two ten-foot sections. Both hoses are 23 mil in thickness and come with rotating fittings that allow for an easy and secure connection. The hoses are made of stabilized poly construction that is ultraviolet-proof and leak-proof. The 90-degree elbow sewer adapter can fit in any kind of standard dump inlet. The elbow is made of a clear plastic, which is unusual. The hoses can be used regardless of how hot or cold it is outside, and they are tough enough to take a beating and still work. They are also rather very flexible hoses, thanks to their synthetic nature. You get the best of both worlds of flexibility and toughness that you cannot find in most other RV sewer hoses. The clear adapter works great, and serve a unique purpose of indicating whether or not the hose has finished dumping waste. Once you stop seeing waste flow, you will know that the dirty work has been done. The hoses are designed in a way that makes it hard to clean. After a thorough clean, you can still tell that waste is trapped in between the grooves of the hoses, which is not all that pleasant to think about or deal with. Hose can be rather hard to clean. The RhinoFlex is known for being a very flexible hose from Camco. This is an affordable kit that comes with a few neat extras. This hose comes with a standard elbow adapter so that it works to dump waste at a dump station. This adapter works for up to four different types of inlets, making it a versatile product for any RV owner. The adapter is a plastic white part, but isn’t see-through. The hose is broken up into two ten-foot halves, so if you need a shorter connection to a dumping inlet, you can decide to only use one of the halves. The hose overall is very flexible. If you need the hose to bend, you can definitely count on this one to adapt to any situation. The connections are guaranteed to be secure to a set of locking rings included. This ensures a mess-free experience with no leaks to be expected. The connections won’t stay secure under the most stressful of situations. While the hose flexes nicely, it rather tries to snap back into its unstretched form, thus breaking connections and undoing that you did to attach the hose to the RV nad inlet. When using this kit, try to make a simple path from the RV to the inlet as possible. This next sewer hose kit for RVs is from Thetford. This hose is black with lime green fittings. It is 15 feet in length and comes with an elbow adaptor and a pair of versatile end caps. The 90-degree five-in-one elbow sewer adapter can fit in any kind of standard dump inlet. The elbow is made of plastic, but it is not entirely clear. You are, however, to notice if waste is flwoing through or not. This is a TPE vinyl hose that makes it super rugged and resistant to many hazards, such as extreme heat, extreme cold, abrasions and punctures. With the purchase of this RV sewer hose kit, a one-year warranty is included. This is a crush-proof hose that you can step or drive over and it will not break or leak. The hose simply springs back into form. The universal bayonet mount on this hose makes it easy to set up and connect. This is a very stiff hose, which is hard to bend or flex in the ways that you need it to. Rather than try to bend it, it will deform, as if you were attempting to crush it, which is definitely not what we have been trying to do. Not able to bend hose. Adapter is permanently attached to hose. Lippert here offers a long, 20-foot hose in the color of dark green. For a simple-looking hose, it certainly is a pricey product. The hose is created with a helical coil on the outside, but is lined with a smooth, inner lining so that waste flows right on out without any problems. This lining guarantees no clogs or hardened waste inside the hose. The hose when unstretched is 5 feet and six inches long. It extends to 20 feet when completely stretched. The elbow adapter is permanently connected to this hose, so you cannot take the adapter and hose apart; they act like one big part. This is another tough hose that is resistant to punctures and extreme temperatures. This permanent connection comes with many benefits, such as greater security and quicker setup times. Unlike the other elbow adapters, this adapter is not clear or transparent. The hose is very easy to clean due to the smooth inner lining, and the only way that dried waste inside can be a problem is if you refuse to clean it afterwards. Some users may not like the attached adapter, and rather have the adapter be its own separate part. Having the two parts permanently combined might make storing more difficult. This is an expensive RV sewer hose kit. You can buy two of the least expensive kit in this review with the money it takes to buy this Lippert hose kit and still have money leftover. For a hose that carries human waste, they sure try to make this look as attractive as possible. It is a black hose with bright orange grooves, and it really stands out with how it is colored. There are two hoses that connect to one another to make a long, 20-footer. These hoses are made of thick TPE vinyl, making them very strong and immune to the harsh elements of the heat or cold. This hose comes with a 4-in-1 adapter that permits it to fit with any type of sewer inlet. This way, you can dump in any dumping station without worrying about having the right type. You will not need any other accessory or attachment to get your waste to dump. If you were to step on this hose by accident, or even run it over with your car or RV, the hose instantly springs back to form like memory foam. It is also is resilient and can still work well after it gets crushed, which has surprised us. The hoses are rather stiff, even though they are classified as an offshoot of the RhinoFlex brand of hose, which is meant for light weight and flexibility. The hose is so stiff that it might not even work with regular four-inch bumpers. How long do they make RV sewer hoses? RV sewer hoses, of course, need to lead to somewhere as you are dumping your bodily waste. With this in mind, the RV sewer hose needs to be noticeable long so that the waste you are dumping is both in reach of a place to dump in, and also long enough for nobody to possibly see the human waste afterwards. The common length of RV sewer hoses is 20 feet in length, however, hoses can also be 15 feet in length. Either is adequately long, but if you need a hose that is even longer, there are extension hoses that you can add to your primary hose. Extension hoses are sold in length of two, five and even ten feet. You will need to make sure that the extension is stable enough. Extensions can make hoses as long as 25 feet or more, however, with more extensions to tack on, that is more connections that you have to not just put together, but watch over, so that nothing comes undone and the hose works in the way that you intend it to. What RV sewer hose accessories are necessary? There are many different parts and accessories needed to use an RV sewer hose properly. They will either come in the kit, or you will need to buy them separately. The first accessory is called a fitting. The fitting makes the connection between the hose and your RV’s waste outlet secure. If your hose already connects securely, the right fitting will make it even more so. You also need a valve, and this should be included in every RV sewer hose kit. The valve is what pushes contents through the hose so that nothing gets stuck. Valves are important for water to pass through your garden hose, and they are equally and important for forcing human waste through to the other side. Without a valve, getting this waste out of your hose would be very difficult. Optional accessories include supports for the hose. These supports are meant to elevate certain segments of the hose so that that segment is off the ground. The purpose of these segments is to further allow the waste inside to smoothly travel through and prevent it from getting at a snail pace. These supports can be structured in ways in which the waste travels on a downward incline, so that gravity can work in your favor. When set up this way, dumping all of your waste can take much less time to do. With that said, never have the hose leading waste upa hill or slope, otherwise, gravity will work against your favor and it will be harder to force the waste inside the inlet. Of course, dealing with all your waste is a smelly and odorous experience. Thankfully, there are gaskets that exist that can help keep any odors inside your hoses so that they do not escape into the outdoor air. To add a hose gasket to your connection, you have to fit the gasket around the inside rim fitting of your hose. Then, you should carefully, connect the hose to the inlet, the extension or your RV. The gasket is designed to seal the odor inside so that you do not smell any foul odors during your dump session. This gasket is designed similarly to a gasket you would use for your toilet. How do you set up an RV sewer hose? Whenever you deal with your RV and your sewer hose, be sure that you put on a pair of disposable gloves, as you will always be dealing with hazardous waste. Toilet sewage and grey water should not be taken lightly, so don’t expect that you will never end up touching it each time. While attempting to connect your RV sewer hose, understand that most RV sewer hoses have a bayonet-like fitting that would make a seal that is tight and secure. Connect one end of the hose to the RV’s waste outlet, and the other side to the inlet at the dumping station that you are currently at. Be sure to use an elbow fitting to further guide your waste into this inlet. Depending on the dump station you are currently at, you may need to use a sewer gasket to help mask the smell that will be involved. Camco Revolution vs Rhinoflex: What are the differences? Camco has two different brands of sewer hose. They are called the Revolution and the Rhinoflex. There is actually a significant different among the two of them. The Revolution is a hose that is heavy, but strong, durable and secure. The hose is thick, but at the same time, it is also hard to move and flex in the ways that you would like to. On the other hand, the Rhinoflex is a hose that is lighter than the Revolution, as well as more bendy and flexible. On the flip side, it simply is not as rugged, as durable or even as secure as the Revolution. Both hoses work well, but it’s clear that some RV owners will prefer one hose over the other. If you prefer a strong, stiff hose, you will want the Revolution. If you want a hose that is lightweight and flexible, you should consider buying the Rhinoflex. How often should I dump my holding tanks? The most often we recommend using your RV sewer hose kit to empty your waste tanks is when they are full. The more full your tanks are, the more the solid waste will be able to break down and move out more thoroughly. A full tank of waste will involve more water that gets flushed out with it. It is possible to empty out your waste tank too often. If you dump your waste too often, there will be some waste that will remain inside the tank and harden at the bottom. This waste can also block the tank sensors. In order to remove all the waste inside the tanks as possible, try to wait until they are two thirds full at least. On a calendar basis, if you use the RV every day, we suggest dumping at least once or twice per week. The best RV sewer hose hit is none other than the Valterra D04-0275 20 Feet Dominator Sewer Hose Kit. We have chosen this hose simply because whatever that it does, you will be sure to enjoy. It’s a strong hose that is also flexible and bendable, which really surprised us. While this hose comes in two ten-feet halves, the connections on each of them are really strong and secure. Not to mention, we have had no leaks with this hose. Not in the fittings, not in the material itself, or anywhere. It really behaves and doesn’t cave under pressure once you start to dump your waste. You can trust this RV sewer hose kit to last a long time, so long as you take good care of it. There is nothing we would really change about this hose, other than the effort it takes to clean it out.